Billed as the best young talent in his position at left-back Luke Shaw was always destined for bigger things. At only 18, he was bamboozling the very best in the Premier League in the red and white kit of Southampton. And it was only natural that a big would soon come in and swoop the next superstar from the Saints and Manchester United did precisely that. Under the guidance of Louis Van Gaal, United shelled out 37 million euros for Shaw's service in 2014. He overtook his then-teammate Rooney as the most expensive teenager in football history. But the hype surrounding Luke Shaw soon fizzled out as he was deemed over-weight by the Dutch coach who emphasised hugely on proper fitness levels. Even the method of Van Gaal did not help make life easier for Shaw as he excelled in making impressive over-lapping runs from the wings and then cutting inside or shooting pin-point crosses for the Targetman to pounce upon upfront. And boy how he terrorised the wing-backs in that season with the saints. However, at United that creative freedom to roam around on the flanks was limited as Van Gaal had a strict defence-first philosophy something which Shaw was not best adept at. He was at times found wanting against opposition wingers, and he soon lost his place to the veteran Ashley Young. But he was not the one to back down, and with his hard work and desire he made the necessary technical adjustments to his game and came bouncing back the next season. He was back to being the Luke Shaw of old which earned him a darling of the English football. That was only till he suffered a horrific double fracture in his right leg in Eindhoven. He was playing for the Red Devils in a Champions League Fixture when following a challenge from PSV defender Hector Moreno, the now 23-year-old broke both his fibula and tibia in his right leg and had to be carried off on a stretcher. He recently revealed that his injury led to some complications and he was very near to losing his right leg and the mental agony caused by this frustratingly horrible experience was undoubtedly the most traumatic period of his life. Although, he underwent mental surgeries and could finally walk again but playing football was still quite some time away. However, the young lad never let his fears overtake his desire for playing football, and he started long months in the rehab centre and finally joined the first squad by the start of the new season. That was the season when Van Gaal was sacked, and Jose Mourinho was signed to save United from slipping into perpetual anonymity. Many believed it to be a breath of new life for the left-back as he might as well regain his old form under the Portuguese tactician but that was never to be. He was called out in public for being overweight and having some serious issues with his match fitness. Small injuries in the process also did not help his case, and he was once again ousted by the veteran in Ashley Young and at times the converted left-back Darmian. 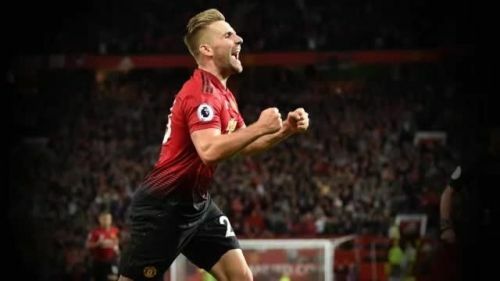 Luke Shaw was ridiculed in the media and was given the tag of another over-rated teenage sensation in the English Football History. And just when everyone thought it was curtains for the young left-back, he came back a with a bang this season. He is easily the best Manchester United player in the four games that have been played so far. He finally scored the first goal of his United career in the Premier League which turned out to be the winning goal for United in that game versus Leicester. For his stellar performance, he was also judged - for the first time- the Man of the Match and his big facial expressions told everyone how much it meant for him. In the next few games, he was the lone bright spark in an otherwise abysmally poor performance by Manchester United in the losses to Brighton and then to Tottenham. His efforts did not go unnoticed as he was recalled into the England Squad by Gareth Southgate for the upcoming friendlies versus Switzerland. And the plaudits did not end there for the gifted left-back as he took United's Player of the Month (August) trophy too. If only he could save himself from small niggles here and there and keep working on his fitness, then one thing is for sure that there is just no stopping Luka Shaw.